I always tell everyone to save your tissue boxes. These sturdy boxes that would normally be tossed into the recycle bin can be transformed into fun and unique party decorations. 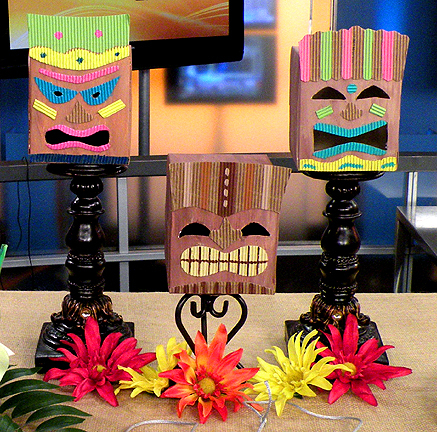 The tiki faces shown were created from my reused stash of tissue boxes, coffee sleeves and leftover acrylic paint. You can either place the opening of the tissue box on the bottom of the tiki face so battery operated tea lights can be placed inside to illuminate the face or keep the opening on top so it can be used as a vase for fabric tropical flowers. I had all of the materials I used for this project on hand so it didn’t cost me a thing to create these fun guys. This entry was posted in Crafts, Media, Recycle. Bookmark the permalink.